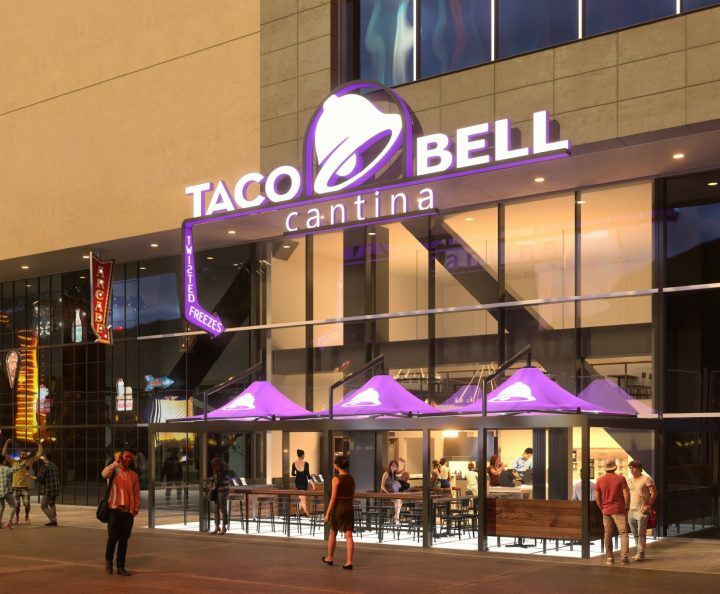 In addition to the regular menu, Taco Bell Cantina (Las Vegas rendering pictured) offers exclusive food items and a range of beer, wine and hard slushies. Fast-food chain Taco Bell will debut a new 24-hour restaurant in Las Vegas later this year that offers its traditional menu and myriad beverage alcohol selections. The two-story Taco Bell Cantina will become the concept’s flagship cantina unit when it opens this fall on the Strip’s Harmon Corner, across from CityCenter and The Cosmopolitan Hotel. Its menu will include traditional Taco Bell staples along with cantina-exclusive items like chili cheese nachos, quesadilla nachos, rolled tacos and chicken tenders. The venue’s drinks offerings will range from beer and wine to frozen Twisted Freezes, slushy-like drinks made with alcohol and fruit flavors. According to reports, the Las Vegas cantina will house a wall of Twisted Freeze machines and offer eight flavors at a time. The company’s newest cantina will have a patio that provides views of the Strip and an open kitchen. It joins Taco Bell Cantina units in Chicago and San Francisco, which opened last year. Taco Bell has announced plans to expand the concept into other large urban markets, too. Sites are being scouted in Atlanta, New York City and Boston, as well as in smaller cities like Berkeley, California; Austin, Texas; and Fayetteville, Arkansas.